The Victims’ Rights Advocate for the United Nations, Jane Connors, briefing the press at UN Headquarters. Briefing the press at United Nations Headquarters in New York for the first time, the first-ever UN advocate for the rights of victims of sexual exploitation and abuse on Friday highlighted her role to give those who have suffered “visibility” and amplify their voices. “I'm the first prong of the full-pronged strategy of the Secretary-General to address SEA [sexual exploitation and abuse] systemwide,” said Victims' Rights Advocate Jane Connors. “My priority is to give visibility to those who have suffered, including through connecting with them personally, and I wish to amplify their voices in a way that cannot be ignored, and support them as they rebuild their lives,” added the Australian law professional and long-time human rights advocate. Since taking up her responsibility as the UN advocate on 14 September, she has had various interactions, including at the High-Level Meeting on the prevention of sexual exploitation and abuse, held in New York on 18 September. She has met with representatives of countries, UN colleagues and other stakeholders and recently visited the Central African Republic (CAR) for two weeks to meet with victims. She said she works with field advocates in four locations – Haiti, CAR, the Democratic Republic of the Congo and South Sudan – who have direct contact with these victims. In the future, other locations might be added. Ms. Connors called on donors to contribute to the Trust Fund for SEA victims so that the UN can help victims rebuild their lives and seek justice. Her appointment is in line with the Secretary-General's pledge – made in his report on Special measures for protection from sexual exploitation and abuse: a new approach – that the UN will put the rights and dignity of victims at the forefront of its prevention and response efforts. Prior to Ms. Conners' briefing, Stéphane Dujarric, Spokesman for the Secretary-General, gave an update on cases of sexual exploitation and abuse, which he said the UN will try to do quarterly. Mr. Dujarric reported that for the period of 1 July to 30 September, the UN received 31 allegations. “Not all of them have been verified, and some are in the preliminary assessment phase,” he said. Out of the 31 allegations, 12 are from peacekeeping operations and 19 from agencies, funds and programmes. Of them, 10 are categorized as sexual abuse, 19 as sexual exploitation, and two are of an unknown nature. He said that 12 of these allegations occurred in 2017, two in 2016, six in 2015 or prior, and the dates are unknown for 11. And 38 male alleged perpetrators have been associated with these incidents. Of the 36 victims, 72 per cent are women and 19 per cent are girls. And 14 investigations have been launched during this timeframe. He also said the UN is piloting a Victims Assistance Protocol which sets the roles and responsibilities of those on the ground to ensure coordination to provide victims with immediate assistance. And with the most recent voluntary contributions from Member States, the Trust Fund in support of victims of sexual exploitation and abuse will rise to $1.5 million, he added. Mr. Dujarric said the Secretary-General has also instructed the heads of all entities system-wide to provide action plans and risk analyses to commit the leadership to the fight against sexual exploitation and abuse, and almost all have been received. Also, mandatory training for all UN personnel prior to deployment has been launched. In the DRC this month, a single and uniform 'Incident Report Form' will be introduced to ensure assistance is provided immediately, appropriate investigative action is undertaken, and to improve data collection. So far, 58 Heads of State or Government have joined the Secretary-General's Circle of Leadership. And 74 Member States have signed the Voluntary Compact and 18 more have formally indicated their intention to sign it, the Spokesman added. 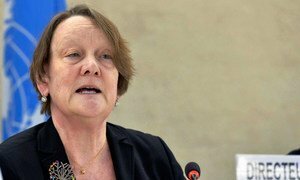 Secretary-General António Guterres has appointed Jane Connors, Australian law professional and long-time human rights advocate, as the first United Nations advocate for the rights of victims of sexual exploitation and abuse.